This is the second of my three blogs dealing with Mt. Everest. In the first one, I covered the main rock units that make up the bulk of the mountain. In this second blog, I focus on the geology of youngest rock unit, which makes up the summit area of Everest. [Note: in my next blog, I shall discuss more accessible exposures of age-correlative rocks in the Nyalam area, west of Mt. Everest]. The only true sedimentary rocks (i.e., non-metamorphosed) found on Mt. Everest are above the “Yellow Band,” and they belong to the Qomolangma Formation. Qomolangma is pronounced "Chu-ma-long-a." On the map, these rocks are shown in brown. 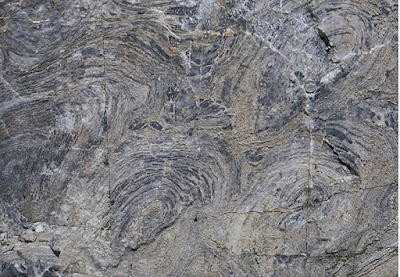 The formation, which is grayish to dark gray to white, consists of limestone, siltstone, and fossiliferous dolomite, is Early to Middle Ordovician in age (about 470 million years old). 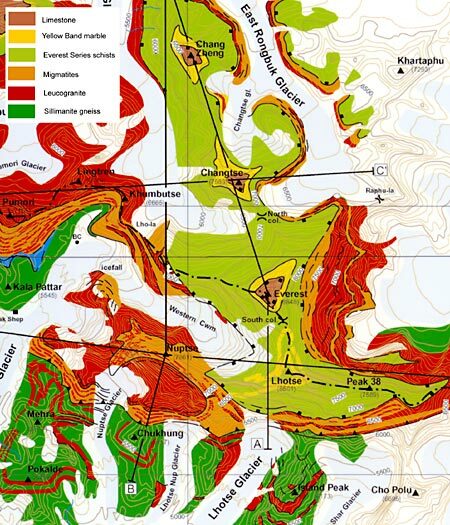 Any younger rocks that used to overlay the Qomolangma Formation have been tectonically denuded. 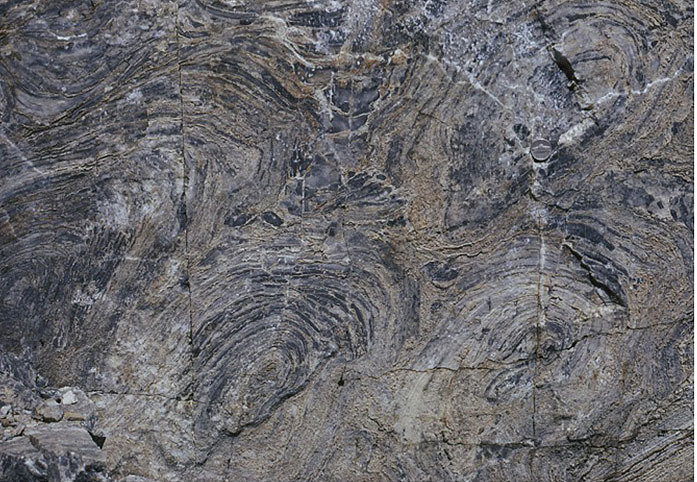 The formation has been broken up by high-angle faults, which terminate at the low-angle fault at the base of this formation. Only a few “grab samples” of rocks from the Qomolangma Formation have been collected by various expeditions. The sediments were deposited in the ancient Tethyan Ocean, which was a tropical ocean. At the base of this formation is a white-weathering cyanobacteria-algal-mat (thrombolite) bed deposited in sunlit, shallow-marine bed about 200 ft. (60 m) thick. This thrombolite bed, which has been tilted by faulting, occurs in the upper end of the tilt, 230 ft. (70 m) below the summit. 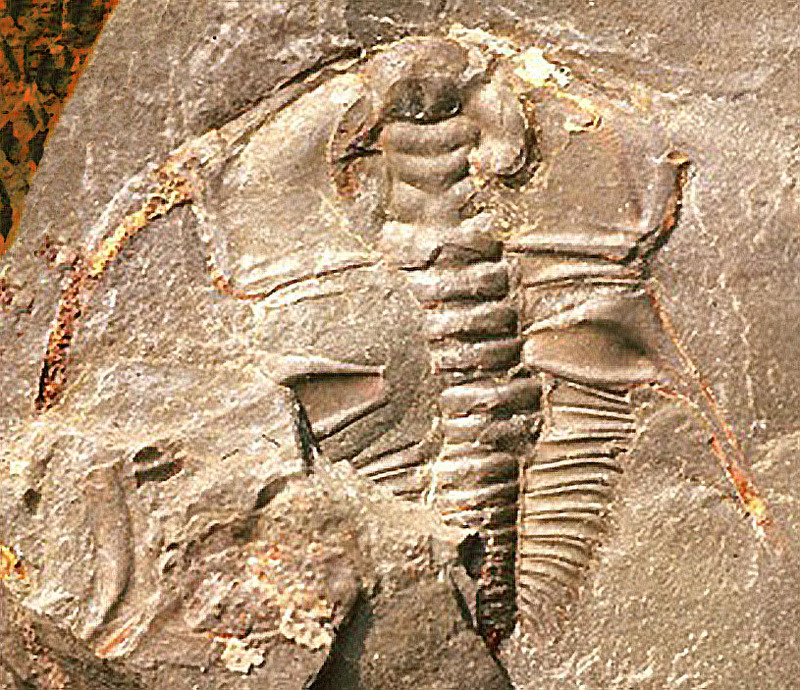 Other “grab samples” higher in this formation have yielded microscopic fragments of crinoids, trilobites, and ostracods. 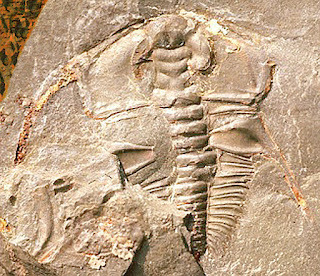 I tried to find images of these fossils but was unsuccessful. So, I resorted to using my own images of representative examples [from California] of an algal-formed bed and a trilobite. 2.5 in. from top to bottom.